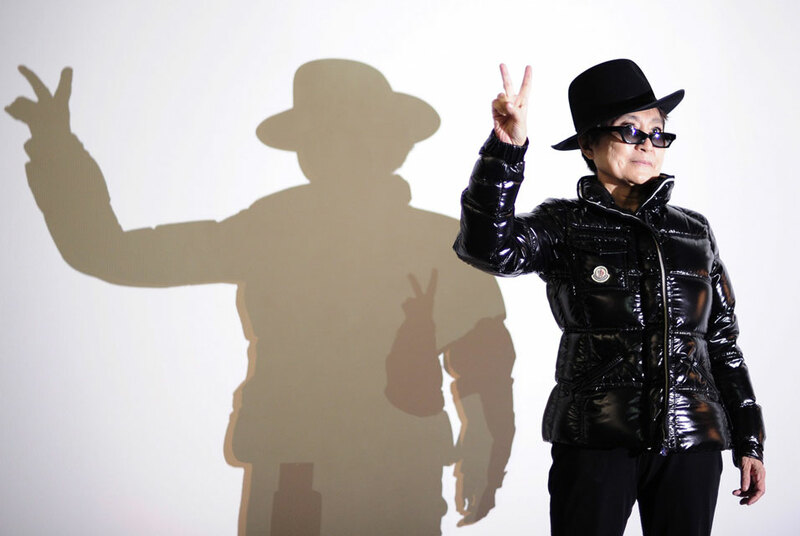 Japanese-American artist Yoko Ono poses in front of the artwork 'Shadows' during the unveiling of her new installation 'Das Gift' (Poison) at Haunch of Venison gallery in Berlin, Germany, 10 September 2010. The installation consists on videos, sound recordings and sculptures. John Lennon's widow wants to point to violence that occurs around the world. EPA/HANNIBAL HANSCHKE. BERLIN.- Haunch of Venison Berlin presents 'Das Gift,' a radical new installation by Yoko Ono. The exhibition opens 10 September and continues through 13 November 2010. Yoko Ono's installation 'Das Gift' consists of sculptural, sound, film, and instruction-based participatory elements, which have been conceived specifically for this exhibition. Ono's pioneering work with conceptual art and instruction-based work began in the 1950s. In 1964, she published the groundbreaking collection of these works, titled Grapefruit. This conceptualism is an underlying force of this exhibition. Through characteristically varied means, Ono addresses violence, healing, transformation, love, and questions the dichotomy of the personal and the global. A HOLE, a fragile yet brutally forceful sculpture, is a focal point of the exhibition. It presents viewers with a pane of glass pierced by a bullet, with an instruction engraved on the glass, which reads: "GO TO THE OTHER SIDE OF THE GLASS AND SEE THROUGH THE HOLE". Ono's instruction encourages viewers to see from the perspective of both aggressor and victim, simultaneously engaging two opposing viewpoints. Speaking about the exhibition, Ono states: "Id like to draw awareness to all the violence that is happening all over the world. I ask the people who come and visit the exhibition to bring something of their own personal experience with violence: a picture, or a text, that will then be placed on the gallery wall. In the upper floor, however, there will be a room where one only smiles." Visitor's smiles will be included in a streaming video, on view during the exhibition. Gasser Grunert Gallery Presents Tim Rodas "Games of Antiquities"